Business has grown 21-fold in nine years, thanks to low-key MD Gautham Pai's talent for teaming up with strategic investors. It was some time in 2003. Mary V. Propes, founder of the US-based home fragrance company, MVP Group International Inc, was not happy with the way her China joint venture was faring. She was looking for a reliable partner outside China. A friend mentioned this to Gautham Pai, son of The Manipal Group Chairman T. Satish Pai, and arranged a brief meeting with Propes in Atlanta. It went well, and Gautham floated the joint venture, Primacy Industries Pvt Ltd. In June 2005, the start-up began producing scented candles at its factory in Mangalore, Karnataka. By 2009, Primacy was doing so well that the owner duo rejigged ownership of the company, giving the junior Pai controlling interest and even subsuming MVP into his group. The 61-year-old Propes still has a significant stake in the joint venture, and faith in Pai. "I trust his judgment," she says. "He has brought global perspective to our business." When he took the plunge, Pai, Managing Director of The Manipal Group, based in Karnataka, knew nothing about the home fragrance business. "I understood it by spending three months at MVP's plant in Kentucky," he says. Last year, he set up another candle unit in Gandhidham, Gujarat. Four-fifths of Primacy's production goes to the US. The Manipal Group is low-profile compared to Manipal Education & Medical Group (MEMG), run by Satish's cousin Ramdas Pai and nephew Ranjan Pai. Bangalore-based MEMG runs Manipal University, Manipal Hospitals and other businesses. Since inheriting the mantle in 2004 from his father, Gautham Pai has built the business at a blistering pace. When he took over, the core activities of the group were commercial and security printing, and publications. Annual revenues were Rs90 crore. 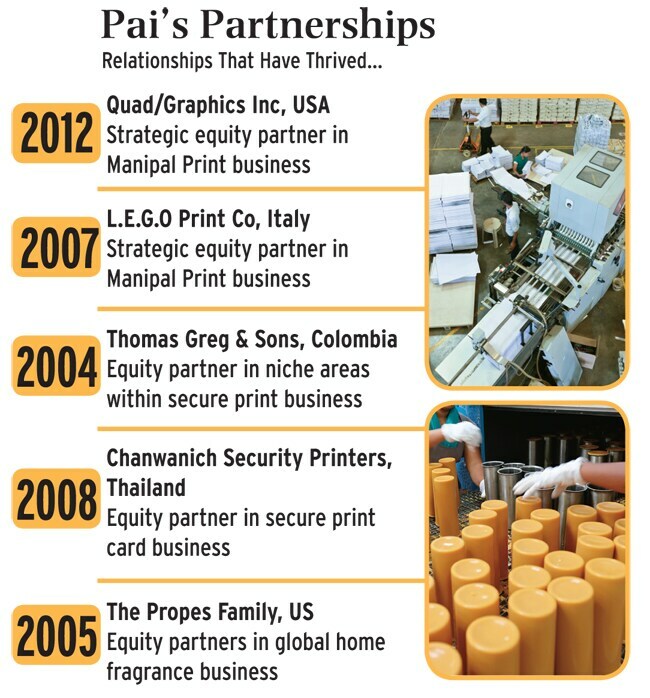 Pai, who studied printing technology at the Manipal Institute of Technology, drew up a five-year plan, floated joint ventures with strategic investors, repurposed the printing business, and made candles a global venture. The group - eight printing and technology solutions companies, two in the home fragrance business and three in media - has leapfrogged into the big league, logging Rs2,131 crore in revenues in 2012/13, growing 21 times in nine years. "Gautham leads his team from behind, and jumps in only when there is a crisis," says J. Ramachan-dran, faculty member and corporate strategy expert at the Indian Institute of Manage-ment, Bangalore, and Pai's mentor. A team of seven management graduates, four of them from IIMs, helps Pai identify strategic directions. Primacy is the world's largest private-label scented candle maker. Large retailers source many products from such manufacturers and sell them under their own brand. Primacy is also a contract manufacturer, meaning it meets the specifications of buyers such as P&G without bearing inventory risk. "About a third of production goes to our largest customer, Walmart, and a fifth to our second biggest customer, Dollar General," says V.K. Thalithaya, President at the company, which runs three factories and three large distribution centres in the US through MVP.The company also supplies to giants such as Dillard's, Target and Tesco. 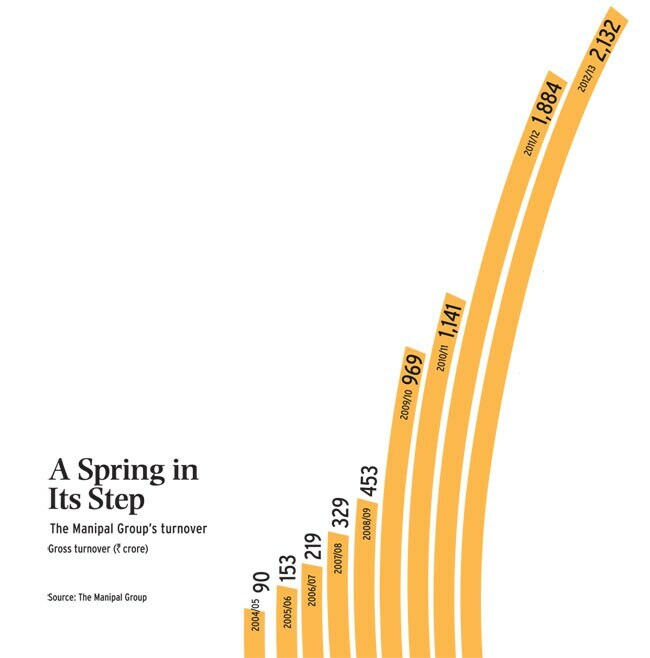 When Primacy started exporting in 2005, India's largest manufacturer's exports were worth around Rs18 crore. But the Mangalore factory was designed to export candles worth about Rs150 crore in the first year itself. "In three years, we became the leader in Asia," says B.G. Vishnuprasad, Head of Strategy at the The Manipal Group. "Gautham is the only third-generation Pai who has not gone abroad for management studies," says his wife Vanitha Pai, a postgraduate in journalism. After graduating from college in 1999, he joined the family business and got exposure that he would perhaps have missed had he gone to business school. 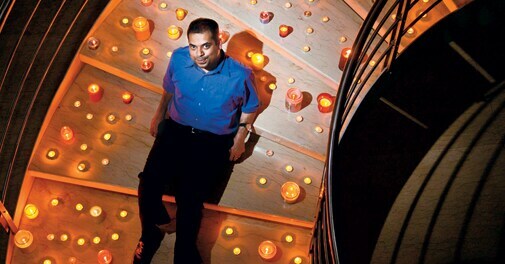 "The candle business was entirely his brainchild," says father Satish. Until Pai came on board, the group's Manipal Press, which printed cheques and other secure products, ran its affairs in a traditional way. Two years ago, Pai, mindful that transactions were increasingly digital, renamed it Manipal Technologies Ltd to reflect its new direction. This past August he hired Abhay Gupte, the Bangalore-based managing director of Logica India, a global IT and business services company, to head it. "We are moving from order-specific business to providing end-to-end solutions," says Gupte. "For instance, we handle the entire credit and debit card process for banks, from printing cards to delivering them to individual customers." Four years ago, the company set up a unit in Kenya, and is set open another in Nigeria. To raise capital, Pai looks to strategic investors or banks, or both. He prefers strategic partners as he believes they bring in a lot of value. The group has five joint venture partners in print, and one in home fragrance. It has a majority stake in all of them. Pai's colleagues say he is reticent and remains calm through even severe setbacks. For instance, in January, a fire reduced the Mangalore candle factory to ashes. In six months, he rebuilt the factory and resumed production. In five years, Pai says, candle revenues will touch $1 billion a year, and Manipal Technologies will be Rs2,100 crore company. As for the media business, Manipal Media CEO Vinod Kumar says his company will bid for an FM radio licence at the next auction and is exploring opportunities in television. "In the past four years, we grew at an average rate of 17 per cent, as against the single-digit growth of the industry," he adds. Strategy head Vishnuprasad says the group plans to strengthen its presence in branded home fragrances. Primacy owns US brands such as Colonial Candle and Carolina Candle, and the Indian brand Ekam. Pai has fared better in business-to-business than consumer business. For example, his mobile handset brand, i-On, failed after a few years because of branding and distribution issues. His DigiGo brand retail printing outlets flopped because consumers expected doorstep service, while the company thought they would walk into stores. "In the consumer business, you need to invest a lot, so Gautham makes small forays to understand the space," says Ramachandran. Rating agency CRISIL mentioned in a January note that Manipal Technologies had "larger-than-expected, debt-funded capital expenditure" in 2011/12. "CRISIL believes that it will take longer than expected for the group to achieve significant improvement in its debt protection metrics," the note adds. Pai says he had to invest consistently as business was growing, and that, as a result, all print solutions subsidiaries have started reporting profits. Bangalore-based independent chartered accountant Vivek Mallya says the group shows how a business can be derisked with diversification and a global presence. "But it would do well to list in the US, and create an independent governance structure to move into the big league of India Inc."
The Pais and Ambanis share a cordial relationship. In the early 1960s, Syndicate Bank chairman T.A. Pai backed Dhirubhai Ambani with a Rs10 lakh loan to launch the Vimal textile brand, says 74-year-old Satish Pai, T.A. Pai's younger brother. Ambani played a key role in settling a dispute among the second-generation Pais. The settlement in the mid-1990s saw mattress brand Kurl-On go to Satish's older brother Ramesh, who heads Manipal Group (Gautham's group is The Manipal Group). Satish has retained warm ties with cousin Ramdas of MEMG.